Today I was linked to in a BBC article about Geeks and Nerds, so I’d like to introduce myself to anyone new who just arrived. I do these now and then, saying hello to new followers, writing what I’m currently up to. Today seems different though. Today tastes like truth. This year was the hardest and strangest of my life. I say this as a person who has been a contortionist in a Freak Show. I say this a person who makes games about zombies and takes photos of trolls. It’s been weird. And sad. And, yes, wonderful. In 2011 I got pregnant and I lost my full time job. The grant ran out and wasn’t renewed. I was devastated. 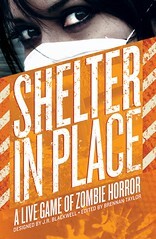 But my book, Shelter in Place, a role-playing game about the zombie apocalypse, had just come out and I figured that it couldn’t be too hard for a published author with a Masters degree to find a job. By January 2012, I was starting to get discouraged. The job search that I thought would be so easy was taking much longer. I was hired on at Galileo Games as a Creative Director, doing things that I love but only making a small percentage of what I used to. I worried about the future. My friend Jennifer Rodgers and I decided to go to the Global Game Jam on a whim. The Game Jam is where a bunch of game designers get together and make a game over a weekend. That weekend I created a game with five other designers called Velociraptor! Cannibalism! We fell in love with the game and decided we’d try fund the art and production through Kickstarter. By February, I could feel the tiny movements of my baby inside me. My little baby would be rocked to sleep when I ran on the treadmill, and would wake up and dance when I ate. In March, the Velociraptor! Cannibalism! team launched the game on Kickstarter and I went into the doctor for the official halfway mark ultrasound. Most of the tests I’d ever done were fast – they try to move you though efficiently – but the doctor was hovering over the ultrasound, looking for something. Finally he said “I can’t find the other kidney.” Then he started to find other issues. A list of issues. We did an amniocentesis – that’s where a long needle is inserted into your stomach to collect some fluid. It hurts exactly as much as you think. By that time, I hadn’t eaten in five hours. I passed out. A few days later, I went into labor. I gave birth to my son, Corvin, when he was 22 weeks old. He lived for two hours and died in our arms. A week later, the Velociraptor! Cannibalism! Kickstarter ended. We had raised $43,619 to fund the art and print run of the game. It was an incredible success and I could barely feel it. I was fortunate to have a supportive team around me who picked up the slack when I couldn’t carry it. 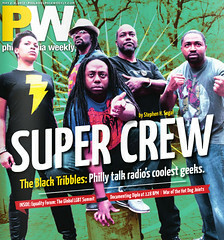 Two weeks later, I shot my first newspaper cover. It’s a dream for any photographer to be recognized that way. On an intellectual level, I was delighted. Emotionally, I was trying to feel anything. That May, my husbands first graphic novel, The Battle of Blood and Ink, came out from Tor. That’s when the OBGYN asked me to come back in for a biopsy. They told me I might have cancer. In June, I was in an art show where I sold a print for over a hundred dollars. I was waiting on test results. In July, the doctor told me that they couldn’t be sure about my results. I could get a procedure done to take out the tissue that might be affected, or I could wait. Test again. I decided to wait. In August, I was invited to speak in New York City at the Museum of Arts and Design. Shelter in Place won an ENnie, a big award in gaming, and a special honor for a first time game designer. On September 1st, I did a maternity photoshoot for a friend having her first baby. A son. I also started volunteering for the Red Cross. I was on call to as a disaster photographer. I got to meet heroes. It was humbling and uplifting. In October, I ran a 5k race. Now it’s November, and I was interviewed by a reporter at the BBC about Geeks and Nerds. As a self-identified Geek, I could not be happier that they asked me for my opinion, and quoted me in the same article along with one of my literary heroes, Neil Gaiman. The reporter, one of the nicest people I’ve ever spoken to, called me because she had read my essay, Presupposition of a Geek Hierarchy, and found it funny. To be contacted because of the quality of something you’ve written is a great honor. It has been a tremendously difficult year for me, and I don’t know what next year will hold. I do know that I am surrounded by love, and that I knew love for a child that broke me open and made me whole. I can honestly say that I am a better writer for my grief; funnier and sadder. But is a price tag I would never willingly pay. Yet here I am, my ENnie next to me as I type this, quoted by the BBC, my first book on shelves and my photos on the cover of newspapers and books. Every month an honor paired with suffering. Through everything, it comforts me to make art, to tell stories, to shoot photographs and design games. I can’t say what’s coming next, but I can say, whatever happens, I’ll be creating though it. I invite you to come along with me. Wow – that’s a hell of a year, JR! My heart went out to you, reading this. I know we’ve only worked together briefly, but thanks for writing this – a little chance to get to know you a bit. 🙂 All the very best for 2013!